The Cold-Formed Steel Engineers Institute (CFSEI) has published a new Technical Note, “Attachment of Cold-Formed Steel (CFS) Framing to Precast, Post-Tensioned and Hollow-Core Concrete,” designated as Tech Note F502-18. 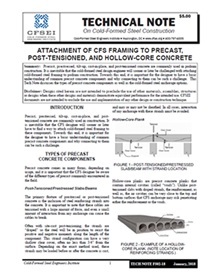 The document provides an overview of precast, prestressed, tilt-up, cast-in-place and post-tensioned concrete components for building construction and the various cold-formed steel anchorage options recommended for proper connections, including power-actuated fasteners, drop-in anchors, screw anchors and expansion anchors. Two design examples are provided. Tech Note F502-18 was developed by Derek Putz, P.E., Project Engineer for Matsen Ford Design Associates, Inc., to assist cold-formed steel design engineers who are challenged with attaching cold-formed steel framing to podium construction. This Technical Note is the latest in CFSEI’s continuing series of instructional documents on topics related to cold-formed steel framing for commercial and residential construction. CFSEI Technical Notes are available free of charge to CFSEI members and non-members can purchase them at the online AISI Steel Store.